From Bandai Hobby. All nine members of Aquors are now available on stage as figurine model kits! The faces of these precious members have been cutely reproduced and each member's different eye colors are exquisitely recreated using layered injection technology! Use the included display stand and background plate to recreate the Love Live! world view! Assemble all nine members and recreate the best parts of the group's debute single 'Kimi no Kokoro wa Kagayaiteru Kai?' Set includes background plate, stage decoration plate, body, and display stand. LOVE LIVE SUNSHINE EXQ YU WATANABE FIGURE LOVELIVE! 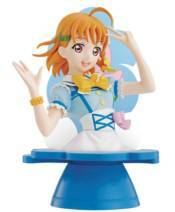 SCHOOL IDOL FESTIVAL FIGFIX MAKI NISHIKINO: CHEERLEADER VER.